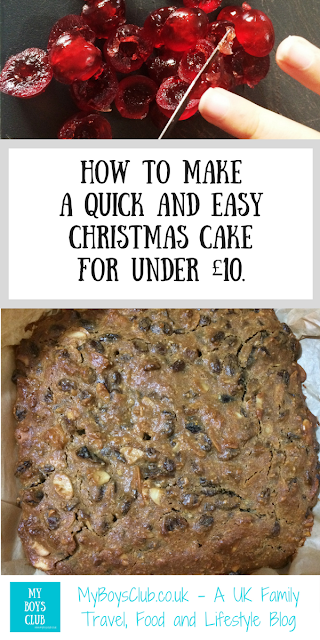 Can you make a Christmas Cake for less than a tenner? Actually, yes you can. It's quick, easy, tasty and the family can help you make it too. A slice of Christmas cake is not to everyone's taste but I love it. The smell, the texture, the taste - it's an important part of Christmas for me. It's got to have marzipan, and icing and I don't even mind if people want to eat it with cheese. It's all good. So a few years ago I decided to start making my own. Shop bought ones are just not the same. And now making the cake is part of the festive season preparations in our house. And all for just under a tenner too. 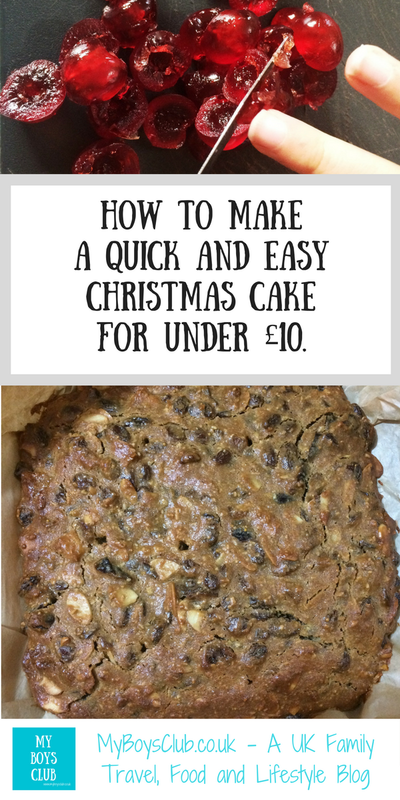 I'd baked our own Christmas Cake a few years running, then one year I totally forgot about having to soak the fruit first. The boys were young but eager to assist and we'd had it planned for ages to bake the cake that day. Not wanting them to be disappointed I googled for a solution - with my fingers crossed. And yes, Google came to the rescue. There are Christmas Cake recipes that don't involve soaking, you can just buy the ingredients and make the cake on the same day. Who knew? Well, not me before that day anyway. Would it work, though? Admittedly I was a little anxious that first year, however, it tasted so good that it is now the recipe we use every year - I've tinkered with it a little to suit our tastes but here goes. 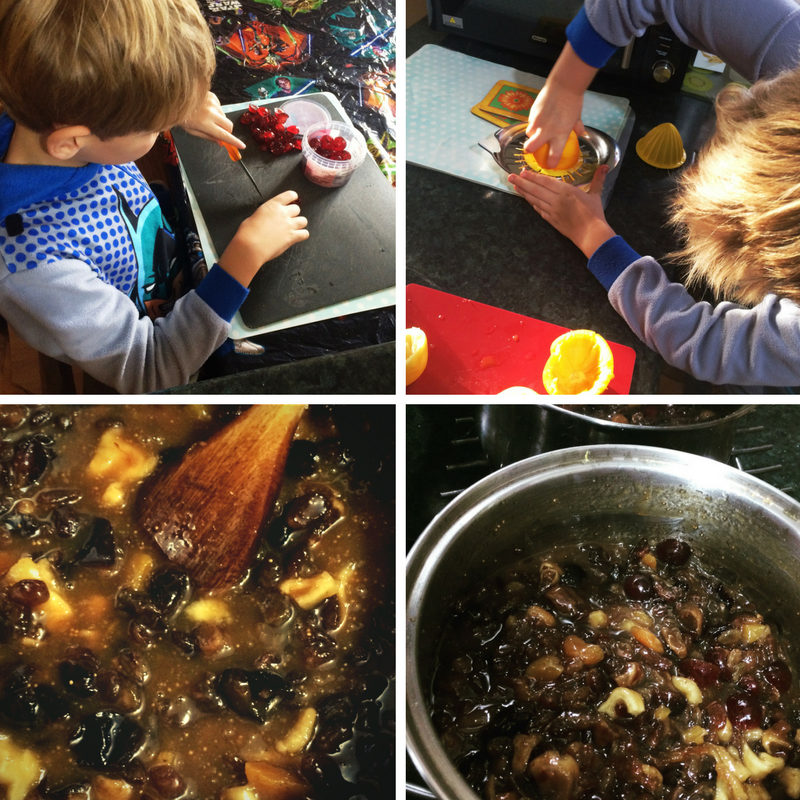 Not being a fan of candied peel we don't use traditional packets of mixed dried fruit, instead, I buy glace cherries, sultanas, apricots, dates and figs and then chop them up. 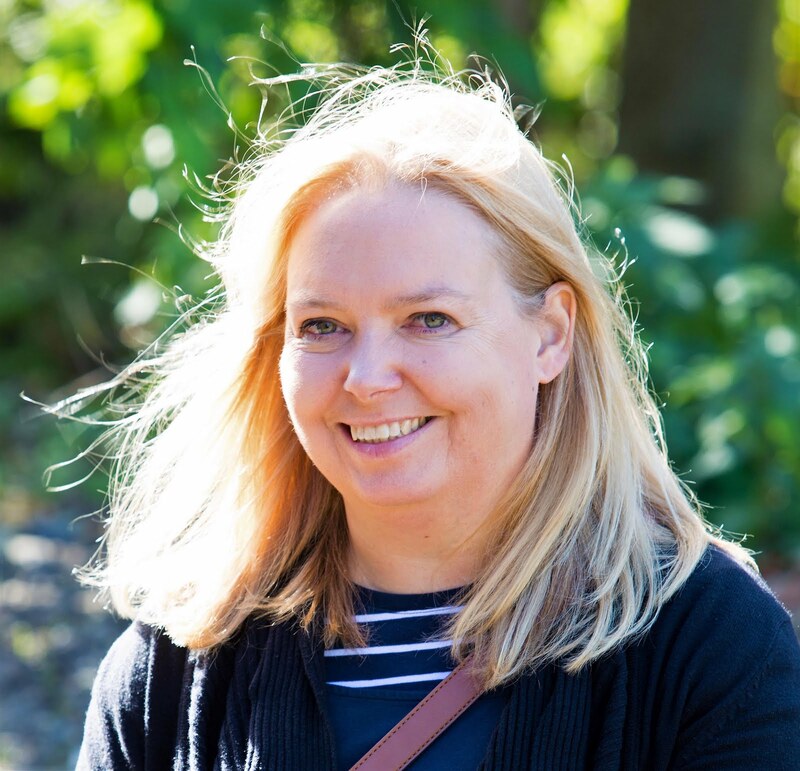 I've found it doesn't really alter the taste much whether its sherry, whisky, brandy or rum - this year it was sherry but if you don't like alcohol try fruit juice instead. The boys helped by squeezing and zesting the lemon and orange, chopping the fruit into smaller pieces and giving it a good old stir! Me and the boys made our cake on Stir-up Sunday - the last Sunday before Advent, which is the traditional start of the Christmas season, but in past years I've made it nearer to Christmas and it has tasted just as delicious. So there is still plenty of time for you to get baking. 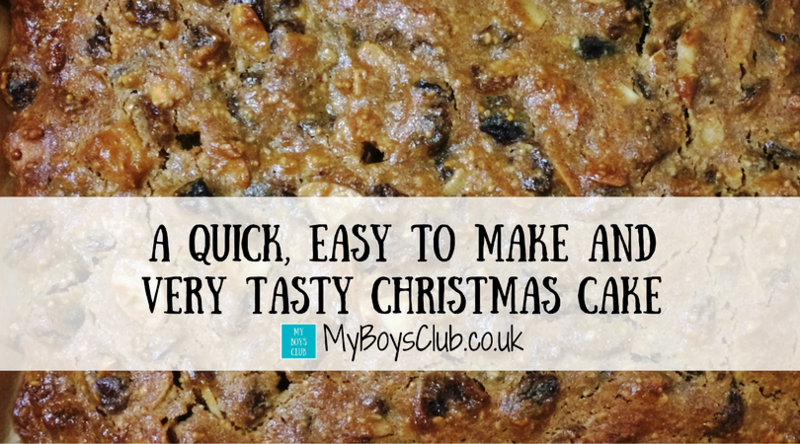 If you have never made a Christmas Cake before, give it a try. It takes less than half an hour to prepare and about 2 hours to cook. Last year a friend asked for the recipe as she had always struggled to make a cake that her family liked, yep you guessed it this one worked perfectly for them too. Now we just can't wait to ice it and eat it. 1. Put the dried fruit, zests and juice, alcohol, butter and sugar in a large pan set over a medium heat. Bring to the boil, then lower the heat and simmer for 5 mins. 2. Then tip the fruit mixture into a large bowl and leave to cool for 30 mins. 3. Heat oven to 150C/130C fan/gas 2. Line a deep 20cm cake tin with a double layer of baking parchment. Tin can be square or round. 4. Add the remaining ingredients to the fruit mixture and stir well, making sure there are no pockets of flour. 5.Tip into your prepared tin, level the top with a spatula and bake in the centre of the oven for 2 hrs. 6. Remove the cake from the oven, poke holes in it with a skewer and spoon over 2 tbsp of your chosen alcohol. Leave the cake to cool completely in the tin. 7. 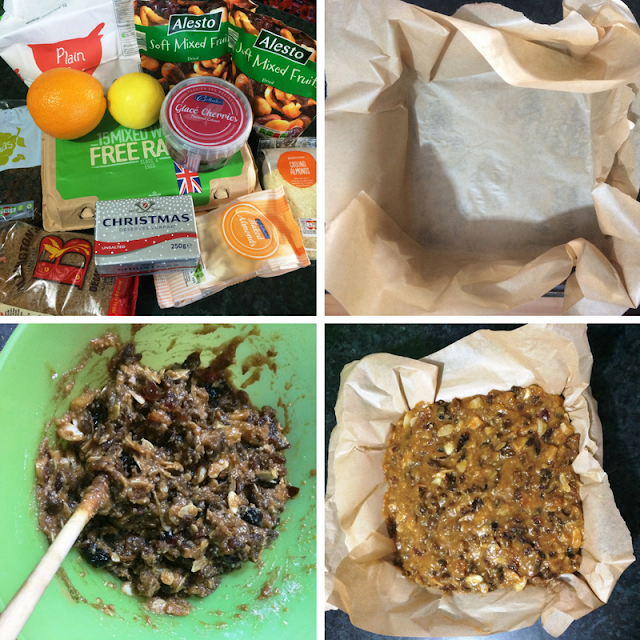 To store, peel off the baking parchment, then wrap well in cling film. 8. Feed the cake with 1-2 tbsp alcohol every fortnight, until you ice it. Don’t feed the cake for the final week to give the surface a chance to dry before icing. The recipe says it makes 12 slices with an approximate 678 kcal per slice - however, we usually get about 30 slices in total, and I don't even think they are small, making the calories count somewhat better to bear at 271. We spent just under £10 on ingredients. Marzipan and icing will be additional, and it took less than half an hour to prepare and about 2 hours to cook. I always let the boys help decorate the cake just before Christmas. I think their efforts are pretty good too! 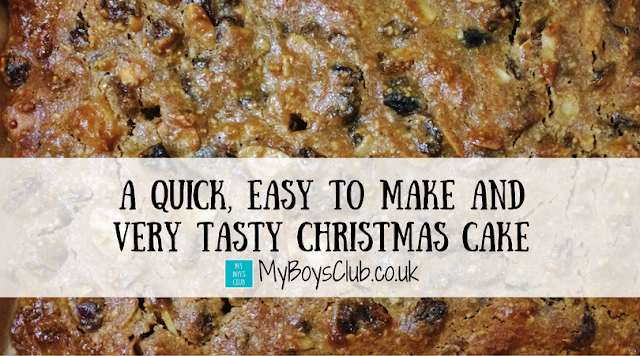 Have you made your Christmas Cake? 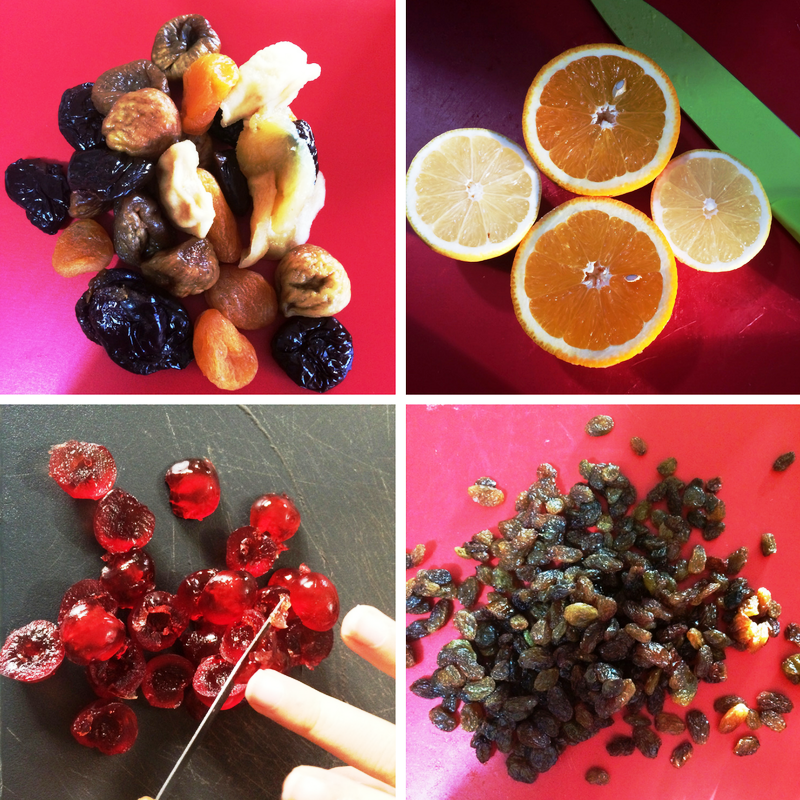 Do you soak the fruit or use the quick method? Ohh yum! This looks and sounds delicious! It looks delicious, and perfect for people like me who are terrible at planning ahead!